As a base movement, the Calibre 36 opened up a new chapter for the German manufacture and this week, they presented two new models: the Senator Excellence Panorama Date and the Senator Excellence Panorama Date Moon Phase, adding a big date module and a moonphase complication to the new movement. 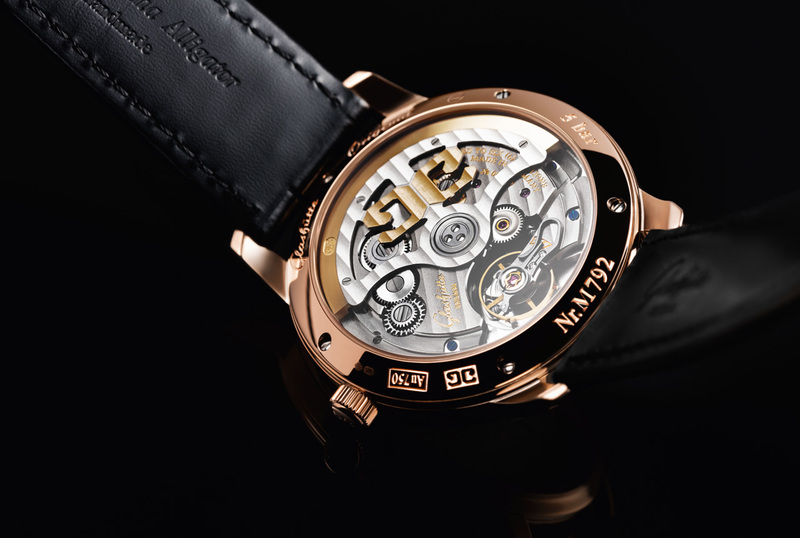 The Panorama Date is actually a big date complication, an Haute Horlogerie version of the conventional date displays, in which the numerals are printed on two concentric discs displays on the same level. A precise jumping mechanism enables a higher accuracy of the date change, exactly at midnight. On the Senator Excellence Panorama Date, the softly rounded date window is placed between 4 and 5 o’clock, with an elegant two-step passe-partout. There are two versions of the Senator Excellence Panorama Date, stainless steel (Ref. 1-36-03-01-02-01) and red gold (Ref. 1-36-03-02-05-01). 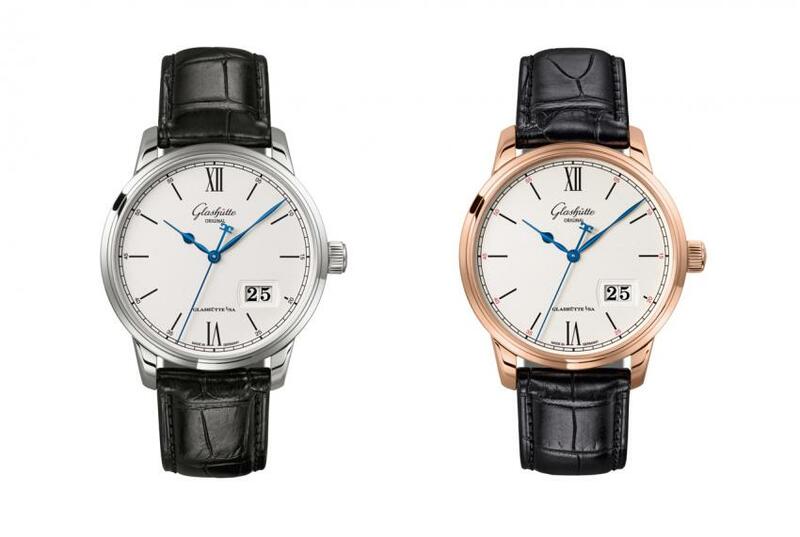 Besides the different materials used for the case, there is a subtle difference between the dial of the two models. On the silver grained dial the black chapter ring, the roman numerals and the hour indexes are laser-engraved and galvanised. On the rose gold version, the tiny minute numerals are printed in red, while on the stainless steel model they are black. Blued-steel pear-shaped hands and a filigree seconds hand render both timepieces easily legible. In both cases, a black Louisiana alligator leather bracelet and pin buckle assure the wearer both elegance and comfort. This model balances the Panorama Date function with a moonphase complication, which is placed between 10 and 11 o’clock. 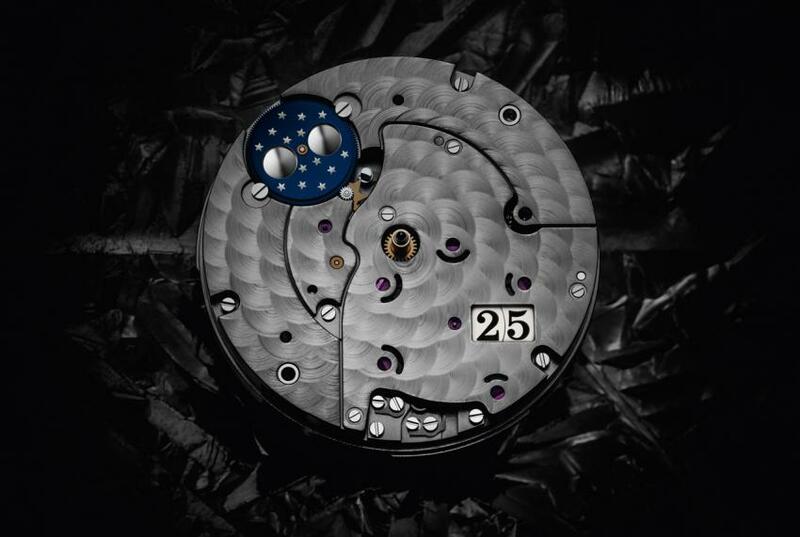 The soft curves of the moonphase window reveal a silver moon floating above stars on a deep blue sky. Because of the size of the moonphase display, the Glashütte Original logo is moved to 9 o’clock and it is beautifully balanced at 3 o’clock with the Glashütte I/SA inscription. 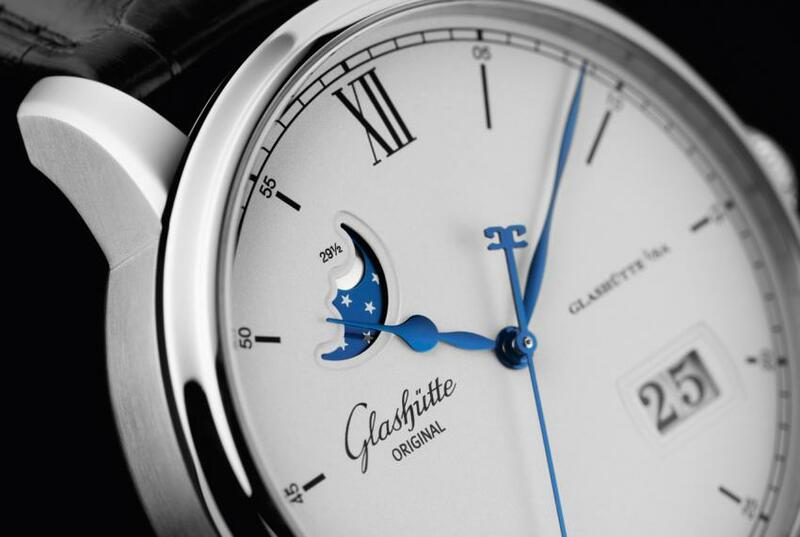 The two flavours of the Glashütte Original Senator Excellence Panorama Date Moon Phase: stainless steel (Ref. 1-36-04-01-02-01) and red gold (Ref. 1-36-04-02-05-01). While these watches required adding a Panorama Date and a Moon Phase modules to the base movement, the driving principles behind the development of the Calibre 36 — stability, precision, extended power reserve and timeless beauty — were strictly enforced. User friendliness was also an important factor — the moon phase can be set using the crown, as can the date on both models, which renders an additional corrector on the case superfluous. In position 1 the crown serves to wind the watch, in position 2 both the date and moon phase can be set, and position 3 permits the owner to set the time of day. Thanks to its fine-toothed gear the moon phase also scores high in terms of precision: in theory, 122 years will pass before it needs to be corrected by one day in order to achieve renewed conformance with the synodic (lunar) month of 29 days, 12 hours, 44 minutes and 2.9 seconds. 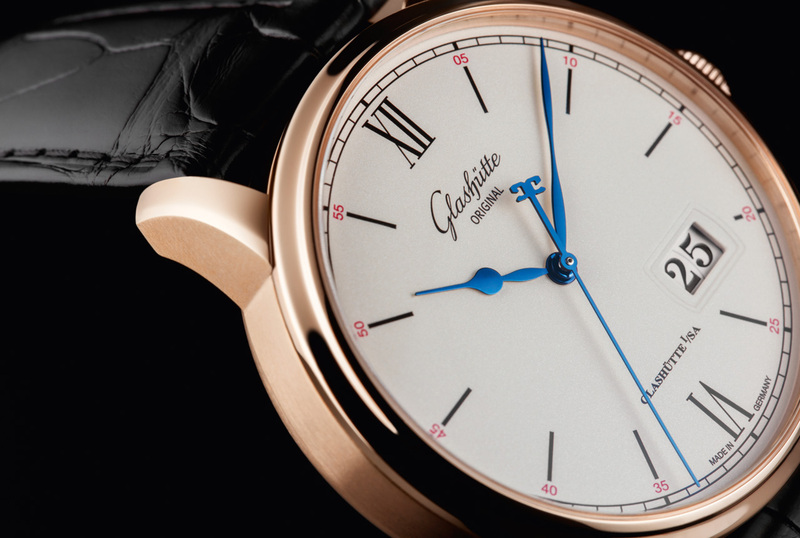 Glashütte Original Calibre 36-04 with Panorama Date and Moon Phase modules. Every Glashütte Original Senator Excellence watch, whether the three-hand model, the Panorama Date or the Panorama Date and Moon Phase, is thoroughly tested for 24 days, under conditions that surpass the requirements of the German Chronometer certification test. The back of a Senator Excellence features a special engraving attesting the quality of the watch and in addition the owner is provided with an examination certificate detailing the most important test results. There is also an online portal, where the owner has the opportunity to review individual test results and to learn about specific test procedures. 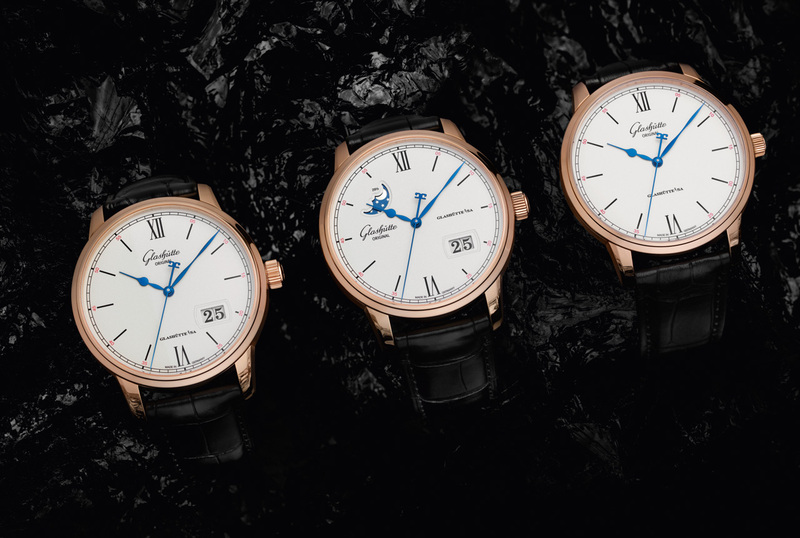 All these steps are further proofs that Glashütte Original is targeting the connoisseurs, the passionate collectors of watchmaking excellence. The back of the Glashütte Original Senator Excellence Panorama Date. 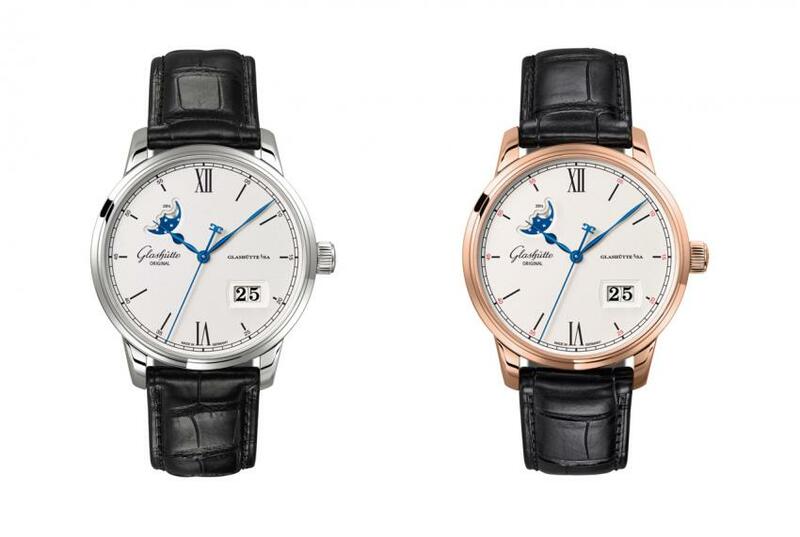 When it comes to price, Glashütte Original is known as a brand that offers a fantastic value for the buck. The stainless steel Senator Excellence Panorama Date starts at $10,400 US on leather strap, or $11,900 US on steel bracelet, and $20,900 US the red gold model. The Senator Excellence Panorama Date Moon Phase starts at $11,400 US on leather strap, $12,900 US on bracelet, and $21,900 US in red gold.